Pocono Coated Products was one of several manufacturers asked by a company equipping military and law enforcement personnel to demonstrate their ability to design and develop a custom coating system for body armor. Of all the companies competing for this business, we were the only one whose coating system worked to specification on this unique project. We designed and developed a coating system with the required accuracy needed for unidirectional fiber. The customer supplied us with both the yarn creels and coating needed. Our design engineer and quality control manager then employed Pocono's pilot coater to accurately coat both sides of the material completely while avoiding any breakage of the delicate yarn. We met our customer's coating weight requirements on creels of yarn 10" wide X 500' long and were able to vary the coating weight as needed. Because the coating weights were so critical, their consistency and function were tested in our facility before delivery to the customer in only three days. Our client was so impressed with our problem solving ability and the speed and accuracy of our coating system that we were invited to join them in the design of the final process. 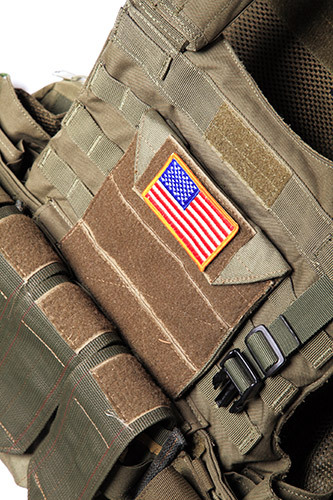 When you can provide coated yarns sufficient for inclusion in vital body armor protection for military and law enforcement personnel, you have truly proven your mettle. Contact Pocono Coated Products to learn more about their abilities to solve unique custom coating problems. Designed and developed coating system with required accuracy for unidirectional fiber.